Click on the product sheet below to download. 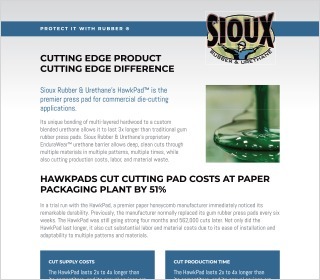 The HawkPad is a premier die-cutting press pad for commercial applications. Made of premium custom-blended urethane with a multi-layered wood backing, it outperforms traditional gum rubber press pads by its unparalleled ability to resist shredding and dust packing even with deep cuts. 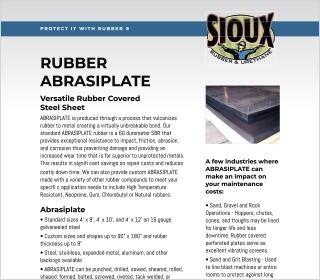 ABRASIPLATE is produced through a process that vulcanizes rubber to metal creating a virtually unbreakable bond. 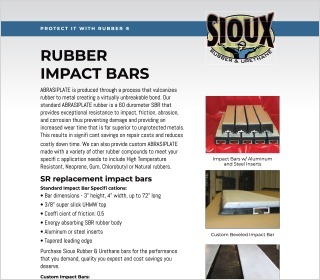 Installed at transfer points, Sioux Rubber & Urethane impact bars are made of premium impact resistant rubber and high quality UHMW to absorb the energy of falling material, prevent damage to your conveyor belt and keep the product where it should be – on the belt. 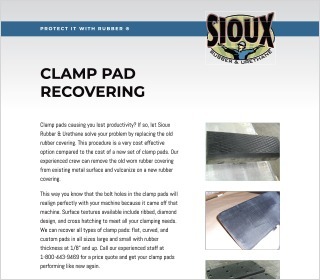 Clamp pads causing you lost productivity? 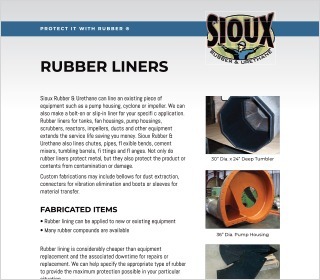 If so, let Sioux Rubber & Urethane solve your problem by replacing the old rubber covering. 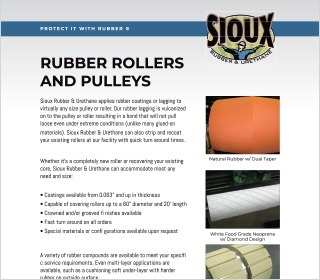 Sioux Rubber & Urethane applies rubber coatings or lagging to virtually any size pulley or roller. Our rubber lagging is vulcanized on to the pulley or roller resulting in a bond that will not pull loose even under extreme conditions (unlike many glued-on materials). 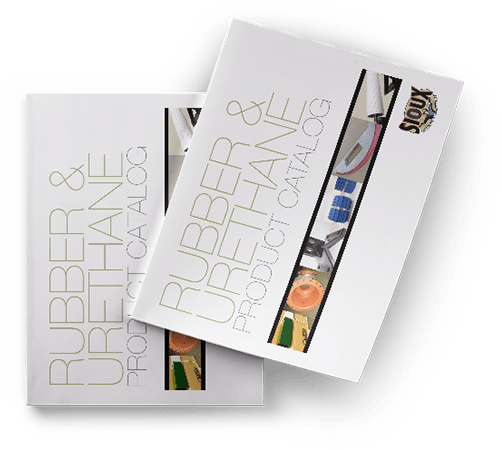 Sioux Rubber & Urethane can line an existing piece of equipment such as a pump housing, cyclone or impeller. Sioux Rubber & Urethane specializes in custom work. We apply rubber to existing parts or build new per your drawings and specifications. 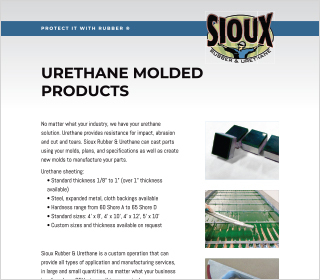 Sioux Rubber & Urethane uses state-of-the-art processing equipment and advanced molding techniques to produce high quality urethane parts for all types of industries. 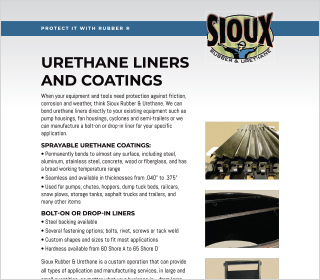 Sioux Rubber & Urethane can bond urethane liners directly to existing equipment such as pump housings, fan housings, cyclones and semi-trailers or manufacture a bolt-on or drop-in liner for your specific application. 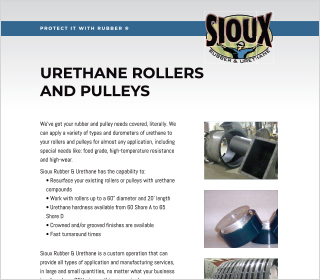 Sioux Rubber & Urethane applies a variety of types and durometers of urethane to rollers and pulleys to meet almost any need. 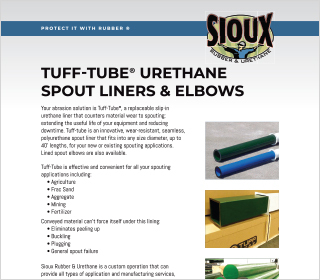 Sioux Rubber & Urethane manufactures an innovative wear-resistant, seamless, polyurethane spout liner into any size, diameter, up to 40’ lengths for new or existing spouting applications.